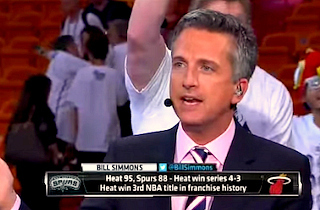 The terms of Bill Simmons‘s ouster from ESPN and Grantland have been set: he’ll get paid through the end of September, but he can’t do a front-facing thing for them until then. No writing, no commentary, no producing, no podcasts, no TV, no nothing. What’s more, according to Sports Illustrated, Simmons won’t even get a farewell column on Grantland, the site which he founded for the sports news giant. ESPN cut ties with the prominent columnist last week after contract negotiations fell through, but reportedly didn’t bother telling Simmons in person: he apparently learned of his axing via Twitter, which, ouch. While ESPN told reporters at their recent upfronts that they don’t predict a staff exodus in the wake of Simmons’ firing, judging from tweets like this written by Grantland’s current staff, we wouldn’t be surprised if that happened.